Last night I drove along Corporation Street and Cross Street for the first time in nearly 10 years - it looked pretty impressive, and it was nice to be able move through the city again by car. And today I bought my first lunchtime sandwiches from the new M&S. Like the store, they're bigger and better than before, though I'm not sure if I approve of the exterior wrapping. 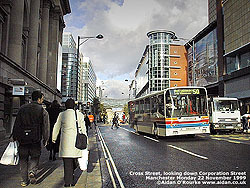 Starting at Cross Street, we approach the Royal Exchange on the left and the Arndale Centre facade on the right - both badly damaged by the bomb. Three and a half years later they've have been fully and spectacularly restored. During the day, Cross Street is now closed to all traffic except buses and bikes - police officers or traffic wardens warn drivers not to enter - but after 6pm other traffic go through, as I did on my way back from north Manchester last night. At the junction of Market St, St Mary's Gate and Corporation St, we enter the part of the city centre that was closed off for over three years. Like a giant glass display cabinet, the massive rectangular form of the Marks and Spencer store dominates the scene to the left. Above us to the right, replacing the infamous tiled exterior of the Arndale Centre, we see one of the two cylindrical glass corner towers, echoing the curved glass exterior of M&S across the street. The facade above the bridge is awaiting development - it's going to be a food court similar to Voyagers, which was closed by the bomb, and will open later next year. Manchester City Council decided to open the new city centre to traffic after 6pm. This is a very good idea, as it keeps the city alive after office hours. However, the daytime closing off of Corporation St/Cross Street and Cannon St/Cateaton St, except for buses and bikes, has resulted in serious congestion elsewhere. A bus broke down last week somewhere in the city centre, and causing gridlock on John Dalton St and Bridge St, now a two-way street again, and the major link between the city centre and Salford. Pedestrianising streets is a noble ideal, but has consquences for the smooth running of traffic. City Council road planners are now reassessing the new street layout. Walking along the new Corporation St, we approach the post box which survived the bomb - this for me is one of the most potent symbols of resistance and triumph over terrorism, and a great advert for the merits of Victorian cast iron. A plaque commemorating the special significance of this otherwise unremarkable post box draws much admiration from passers by. Above the post box, the mathematically graceful form of the new footbridge is stretched across the gap between the Arndale and the new M&S. The bridge looks like it was inspired by a 3D screensaver on the designer's desktop PC. The footbridge and the M&S store are an exercise in hi-tech plate glass and steel, like an airport - in fact more like an airport than many airports look. The red post box was very proud. It had been made in the factory and now it was ready to go out to work. We can enter M&S through the door under the bridge and we are immediately struck by the huge size of the shopping floors, and the sense of light and space. In other ways, though - as I overheard someone saying on the escalator - it's like any other Marks & Spencers, only bigger. Inside we are drawn through Ladies Underwear to the huge glass window overlooking the new Exchange Square - you can stand and admire from the balcony end of the floor. It's certainly impressive, though the huge size of the window seems to shrink the square in front of it. Let's go back down the escalator and walk out onto the square that's been over two years in the making, and was opened with much fanfare last week. In fact it's more of a triangle than a square - bounded by M&S to the south, the Corn Exchange - renamed "The Triangle" to the north west and the still unfinished Arndale facade - now covered in giant posters - to the north east. Pre-June 96, this was the busy Cateaton Street, heavily used by traffic, including many buses. Before the Arndale Centre, buses terminated here, and there was an unusual late 19th century survival, a sort of minature version of New York's Flat Iron building, but with rounded corners. It was torn down in the early 1980's. Now this site is a pedestrianised area, the first new square to be created in Manchester city centre in nearly a hundred years. Does it live up to expectations? I can't say I'm very inspired by the square - or with the contemporary style decorations and street furniture that now inhabit it. The "waggon" seats stand like bizarre outsize childrens toys left there by a giant child who didn't clear up after himself. They don't move, and the wheels, which don't turn, prevent more people from sitting on them. I think the square would look better without them. The Tellytubby-style wind turbines are actually powered by electric motors, and so consume rather than produce electricity - a strange inversion of use in these supposedly ecological times. They detract from the impact of the M&S Building and I wish they'd come and take them away. But if people - particularly children - like them, then let them stay. They are better at last than the palm trees which were originally planned for this location. As for the curved ramps - apparently a way for several wheelchair users simulaneously to access the split levels of this sloping site, I can't quite figure them out. Why are there thick walls between each ramp? Are people supposed to sit on them? It looks like an amphitheatre without a theatre. The walls diminish the feeling of space in this pocket-sized bit of open space in a city centre crowded with buildings, and make the square seem even smaller. A plain, flat open space, with a wide ramp for wheelchair users on one side, would I think have been much better. The stepping stone water feature is an eye-catching piece of street adornment, adding a visual and aural splash of water - well, more eof a trickle, but if you're walking along by the Corn Exchange after having one too many pints of Boddingtons in the Old Wellington Inn, you'd better watch your footwork. Lamps mounted under water and in the paving stones should help on that score. The other items occupying the square, such as the elliptoid uplighter lamps (which incidentally are too dim), and the inverted teardrop-shaped litter bins that look like Daleks redesigned for the late 90's, are pure ET/Millennium, and I'm sure in 10 years time they'll look very dated. The elliptoid uplighters look particularly inappropriate when set against the embellished 19th century-style facade of the Corn Exchange (built 1905), alias "The Triangle", and the rebuilt half-timbered walls of the Shambles.